VOTE For The Top Performance Of The Weekend! The first state-meet qualifier in Rhode Island takes place on Saturday with the popular Classical Classic at Mount Pleasant's Conley Field. How about this past weekend? Well, we had our own Cumberland Freshmen-Sophomore Invitational, but we also had a good number of our athletes travel across the border to compete in a few out-of-state meets. We scanned through those results and picked out what performances we felt stood out from the rest. Now we want your vote! Check out the short blurbs below of the athletes we chose and then VOTE on the one you felt was the best of the best. Voting ends on Saturday at midnight. Woonsocket's Dilyn Cote had a breakthrough meet at Saturday's New York Relays where he upset the field, including top-seed and teammate Jared Briere, to win the hammer throw with a career best of 204 feet, 1 inch. East Greenwich's Connor Sheridan captured the Decathlon at the NY Relays where he compiled 5,776 points. Sheridan won eight of the 10 events. He finished first in the 400m by nearly three seconds where he clocked 53.77. He also leaped 5-8 in the high jump and reached a height of 11-6.5 in the pole vault. Hope's Elijah Akindole placed fifth in the 800m at the Trinity Elite Distance Classic. He ran a PR by almost two seconds with his time of 1:58.01. Check out race video below. 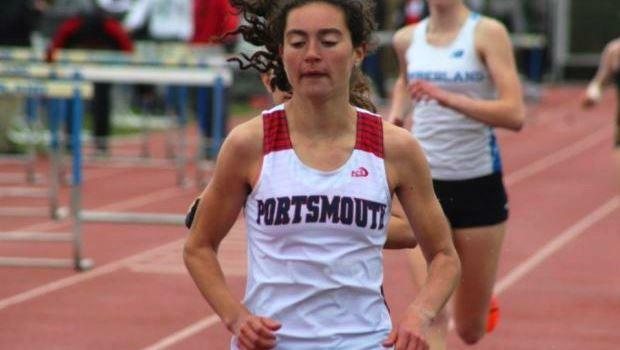 Portsmouth's Elizabeth Sullivan was a convincing winner in the 1,500m at the Cumberland Freshmen-Sophomore Invitational. Sullivan crossed the line in a state best of 4:54. Lincoln's Samantha Andrews took runner-up honors in the discus at the NY Relays. Andrew's toss of 122-5 was just four feet shy of the winning effort of Bloomfield's Brittany Jones.